This is the third of three posts about our new headquarters at 3030 12th Street NE and our tree yard at 3015 12th Street NE in the Brookland neighborhood. We are excited about our new home, and we wanted to share with you some of the green features we have implemented. As well as planting a rain garden for the 3015 12th Street NE property that houses our tree planting operation, we also have a plan to implement a comprehensive system for stormwater management at our main office. The nearly completed design implements a 1,700 square foot bio-retention planter rain garden that will capture up to two inches of rain in a storm, a planted strip of street trees, a specially designed sidewalk that supports the street trees and a cistern that collects rain water. 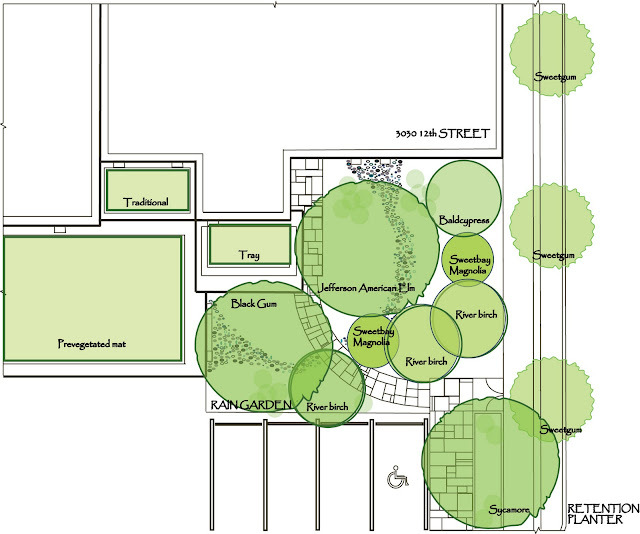 View the full-size draft plan for the rain garden site. Some details may change. In a rain event, ground level stormwater flows from the green roof surfaces and parking lot into the rain garden. Additional rain water is captured by a cistern stored in the building's garage. When a rain event overfills the capacity of the cistern, water spills directly into the bio-retention rain garden. During most rainy conditions, virtually no rainwater will flow into the city's storm sewer system. 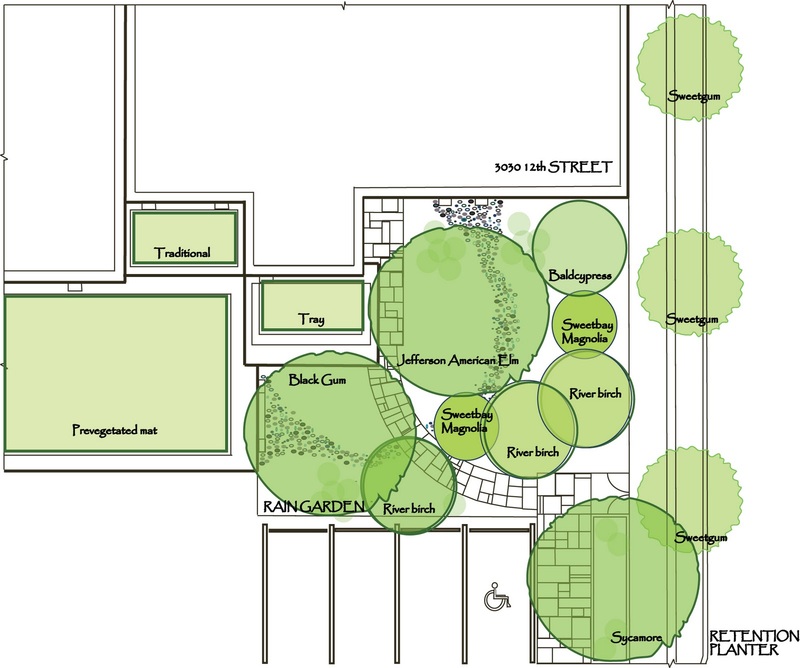 The rain garden will feature a lot of great trees: black gum, Jefferson American Elm, river birch, sycamore, sweetbay magnolia and baldcypress. These trees soak up immense amounts of water and greet visitors to the building. Silva Cells being planted underneath the sidewalk in August 2010. Underneath the 12th Street sidewalk, we constructed a Silva Cell sidewalk, which allows for tree roots to expand underneath the solid ground, using an underground frame and deck support system. It looks like a normal sidewalk above ground and supports foot traffic, but tree roots are growing in the 90% void space filled with soil, expanding far further than a conventional boxed planting would permit. Sweetgum trees will be planted along the road. Casey Trees staff were responsible for much of the planning and design process behind the green construction at our headquarters. As with our green roof design, we could not have accomplished our goals without generous help from our partners. 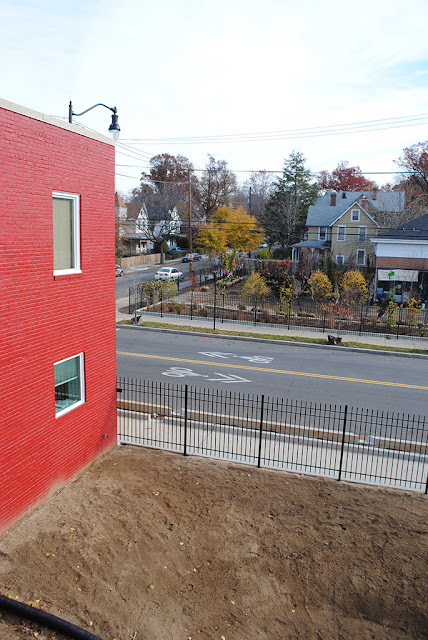 A grant from the District Department of Transportation (DDOT) paid for the cost of installing the the infiltration planters on the 12th Street NE and the Silva Cells supporting the adjacent sidewalk. The District Department of the Environment (DDOE) funded the bio-retention planter and the cistern (as well as the green roofs). The site where the rain garden will be planted, with the newly constructed Silva Cell sidewalk on the other side of the fence. Read the media release about the move to our new headquarters, and check out our website for more photos and information.